NOTE: PLEASE READ THIS NOTICE CAREFULLY – IT APPLIES TO ALL PERSONS WHO VIEW THIS WEBPAGE. THIS NOTICE MAY BE ALTERED OR UPDATED FROM TIME TO TIME. YOU SHOULD READ IT IN FULL EACH TIME YOU VISIT THE SITE.NOTE: THE MATERIALS CONTAINED HEREIN WERE NOT AND SHOULD NOT BE RELEASED, PUBLISHED OR DISTRIBUTED, DIRECTLY OR INDIRECTLY, IN OR INTO THE UNITED STATES OR TO ANY UNITED STATES PERSONS OR IN OR INTO ANY OTHER JURISDICTION OR TO ANY PERSONS IF TO DO SO WOULD CONSTITUTE A VIOLATION OF THE RELEVANT LAWS OF SUCH JURISDICTION. In particular, unless otherwise determined by The Standard Bank of South Africa Limited (“Standard Bank“), its holding company Standard Bank Group Limited, and the subsidiaries of its holding company (the “Standard Bank Group“), you should not access or distribute these materials if to do so would constitute a violation of the applicable laws and regulations. The materials do not constitute or form a part of any offer or solicitation to purchase or subscribe for the securities mentioned in such materials (the “Securities“) in any jurisdiction. Securities have not been and will not be registered under the US Securities Act of 1933, as amended (the “Securities Act“), and no Securities may be reoffered or resold in the United States except pursuant to an exemption from, or in a transaction not subject to, the registration requirements of the Securities Act. Further, unless an exemption under the relevant securities law is applicable, the Securities may not be reoffered, resold, delivered or distributed, directly or indirectly, in or into any jurisdiction if to do so would constitute a violation of the relevant laws of, or require registration thereof in, such jurisdiction. 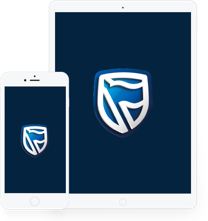 Making the documentation contained herein available in electronic format does not constitute an offer to sell or the solicitation of an offer to buy securities in Standard Bank and/or any other member of the Standard Bank Group. Further, it does not constitute a recommendation by Standard Bank and/or any other member of the Standard Bank Group or any other party to sell or buy securities in Standard Bank and/or any other member of the Standard Bank Group. The information contained on this website has been converted from the format from which the original version of such information was printed. Reasonable care has been exercised to provide accurate information but there can be no assurance that this information is free from error. Neither Standard Bank, nor any other member of the Standard Bank Group, nor any person who controls any of these entities, nor any affiliate, director, officer, employee or agent of them, nor any affiliate of such persons accepts any liability arising out of or in connection with the use of the information set out on this website. I have read and understand the disclaimer set out above.I agree to be bound by its terms. I confirm that I am permitted to proceed to electronic versions of these materials.